Of top priority in all classroom settings is safety. 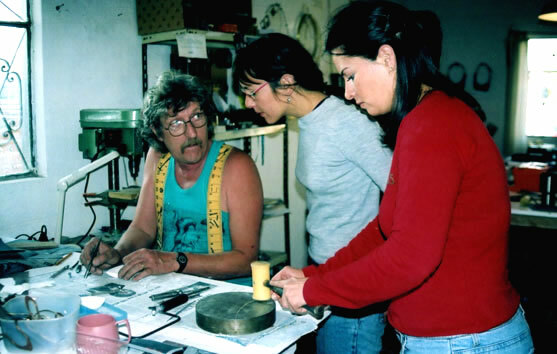 The easiest way to work safely is to adopt a gentle coaxing attitude with the metal, the tools, and the machinery; force and aggression have no place in the jewelry studio. We are working with the metal not at it. There are several techniques which I do not teach, because they require the use, and therefore the disposal, of extremely dangerous chemicals such as cyanide. I feel strongly that the creation of artistic body adornment should not involve harm to any living thing. There is safety equipment – goggles, masks and shields – available in the classroom and lab. This equipment, together with the specific safety instruction given to all students, plus the precautionary posters in the work areas, are of utmost importance at all times, and are combined with the attitudes outlined in the first paragraph.